For the first few months I had the basement sim I had one headset, which connected via a traditional mic input on the back of the PC. I knew that I’d want to be able to fly with two folks in the simulator, and I liked how FlightSim Liberty had an intercom system in his sim and I wanted to model that. 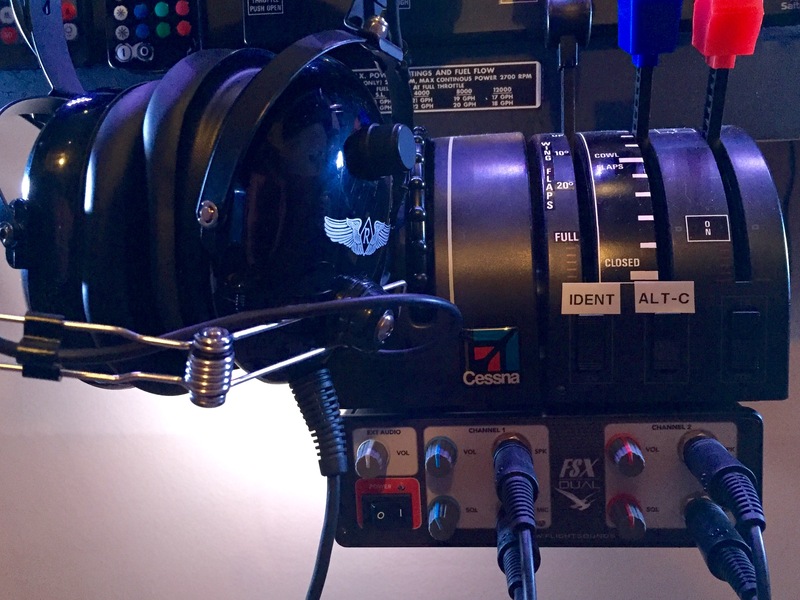 My original solution was to use two USB inputs (which allows the PC to see each headset as an individual sound card, which is helpful for managing simulator sounds), one connected to a Saitek headset via a USB-to-traditional mic/sound converter, and the other connected to a Rugged Radios aviation headset via a USB-to-aviation jacks converter. While this worked OK, this solution does not allow real-time crosstalk across the headsets, so there is always a brief (and distracting if not maddening) delay when the two folks in the sim talk to each other. I researched a number of USB-based solutions, and ultimately settled on the fabulous FSX-DUAL aviation headset/USB adapter from Flight Sounds. Separate external audio volume control, for controlling the sound of the sim, PilotEdge, etc. These last two features are what I was really looking for. First, the FSX-DUAL lets me use my two real-world aviation headsets in the sim, one of which I also use for my real-world flight training. They look, feel, and sound great, and because of their impedance they impart that great “aviation mic” sound when talking to someone else in the sim or a controller on PilotEdge. Second, there is absolutely zero delay across the two headsets. All communication is real-time, and it sounds fantastic. Finally, the “plug-and-play” promise delivers. On my Windows 10 system I simply plugged the FSX-DUAL into a USB port, plugged in the headsets, and was off and running. No driver downloads, no configuration hassles. The Windows audio settings see the DUAL as a headset with mic and I can use and configure them just like any other. It all works great. As do the people at FSX-DUAL. As near as I can tell, the company is based in New Zealand. The ordering and shipping process was simple, and when New Zealand post for some reason returned my unit to them without delivery here in the states, Kate from Flight Sounds let me know, launched an investigation, and re-shipped the unit with track-and-trace free of charge. She was as friendly and as responsive as could be. Truly first class. This is not an inexpensive add-on, weighing in at $219.95 USD. You can buy some real-world intercoms for less, but then need to either settle with each being part of the overall PC sound card, or running a USB-to-aux adapter. As for an out-of-the box solution the DUAL really was the only viable option I found, and candidly, it has been worth every penny. It looks great, works great, and Flight Sounds provided exemplary support. At least for me, the FSX-DUAL from Flight Sounds is highly recommended. This is a great unit and I have just installed one in my sim. 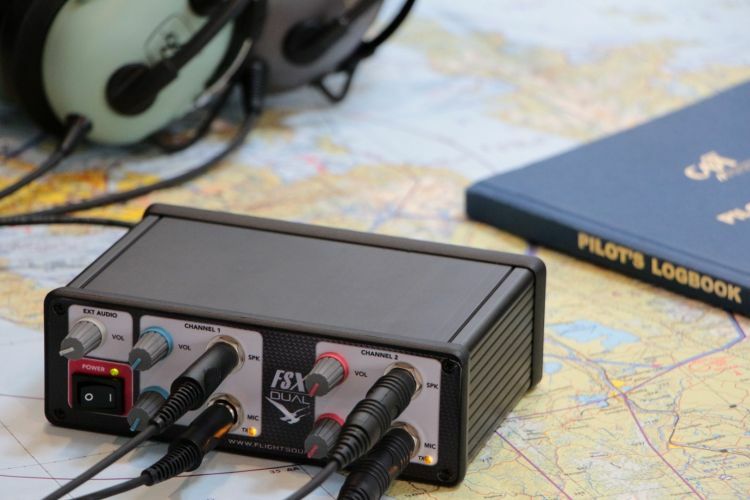 Can you describe how you mapped a yoke button to the PTT function of the Flight Sound X unit? Just assigned it to the ATC function in XPlane’s joystick config screen. Ok. 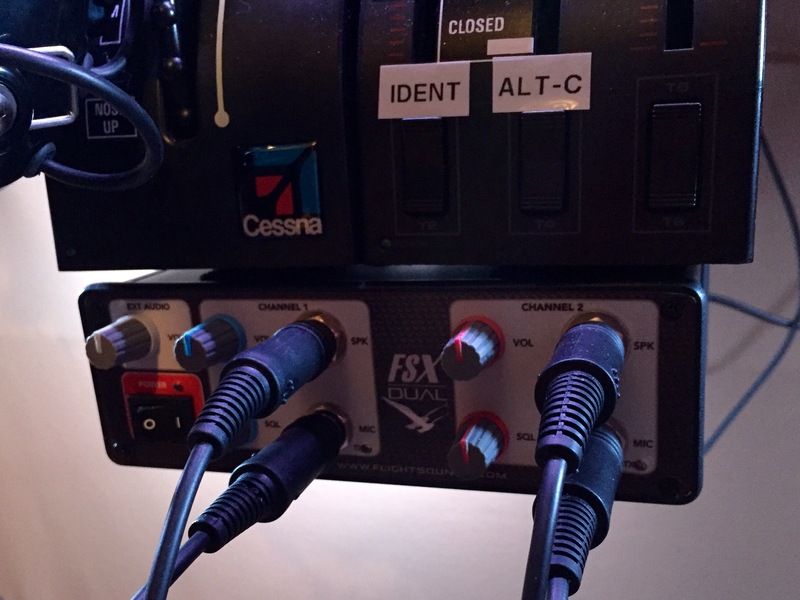 Does the flight sound x ptt lights illuminate when you do this or do you have ithe unit set on master switch? I have the master switch in the back turned on.